EDITOR’S NOTE: See videos of sheep in creeks, dying and dead at Heritage Ranch and being tossed in a truck at the bottom of this story. The videos are disturbing and include cursing. A young lamb struggles and appears to scream as a ranch hand drags it by its hind legs with its head bouncing on the ground to a truck loaded with dead and struggling sheep tossed on top of one another. Dozens of emaciated sheep left to forage for food on the Village of Heritage Ranch’s barren open space have died long and painful deaths. Home owners hiking trails in the northern San Luis Obispo County village discovered the sheep and are pleading with law enforcement agencies and animal rights groups to protect the herd from what they call animal cruelty. Jean (JB) Jaureguy, 69, began raising sheep in San Luis Obispo County 51 years ago. He currently owns more than 5,000 head of sheep he grazes in open space throughout several counties. Owners of land attempting to limit fire hazards allow Jaureguy to graze his sheep for a small fee, Jaureguy said. Jaureguy contends the sheep are not starving and that they look thin because he had them sheared on Feb. 24, three days before a rain storm struck the Central Coast. Jaurequy believes the weather is to blame for the deaths of more than 30 sheep he had grazing at Heritage Ranch, he said. If the deaths are because of the storm, they could be covered under livestock insurance which typically includes the loss of cattle and sheep due to weather and other perils. However, videos taken by Jennifer Weissmuller show dying sheep and sheep carcasses on hillsides, in ravines and in creeks. The sheep in the videos appear abnormally thin and weak. On Friday, Adam Weissmuller called the San Luis Obispo County Sheriff’s Department to report the dead and dying animals, though he said the county failed to send a deputy. On Saturday, he again called the sheriff’s office and also made reports to People for the Ethical Treatment of Animals (PETA) and the California Department of Fish and Wildlife. Weissmuller said a sheriff’s deputy came out to Heritage Ranch over the weekend and opened a case. In addition, PETA officials viewed the videos and have concerns of animal cruelty, Weissmuller said. Jaureguy said he met with deputies who suggested he call them for assistance if the Weissmullers confront him again. The deputies, Jaureguy said, know the Weissmullers do not understand sheep ranching. 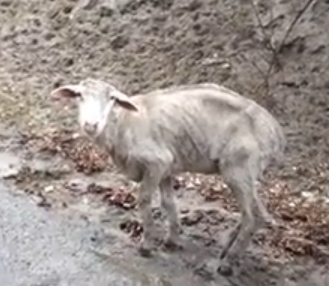 The following is a video taken by a homeowner at Heritage Ranch of abnormally thin and weak sheep left to graze on open space left barren because of the drought. On Saturday, sheepherders are placing the dead and dying animals in trucks. Sheep carcasses and dying sheep in a creek that feeds into Lake Nacimiento. Anybody who expresses an opinion about this story needs to fill out the following questionnaire first – in order to have any credibility. Answer to the nearest 100. [__] How many sheep have you cared for and been responsible for in your life? [__] How many times had you had to get up in the middle of the night to help a ewe give birth or to assist the lambs in their first hours of life? [__] How many times have you had to reach into a birthing ewe to help save the lives of the ewe and/or the lambs? [__] How many times have you had to stitch up a prolapse? Out in the corner of the field, in the rain? [__] How many times have picked up the carcases of baby lambs that were attacked by protected coyotes or foxes or neighbors’ dogs(Sparky would never do that, he is a sweet dog)? I guarantee that the men in this story have a higher score than the majority of the people who have commented here. While I agree with your position, I think requiring experience to have an opinion on something is fallacious. In the end, what most people do not understand is: Sheep are the DUMBEST animals ever. They are quirky and just plain stupid. Requiring a special patience. Ask any rancher, herder, or person who works with them. Dumb. Dumberer. Dumberest.. In the business, they are affectionately referred to as…Meadow Maggots. Roy, I should have said an informed opinion. Having an uninformed opinion is worth absolutely zero. Zip. Nada. I’ve done all of those and more for over 50 years. How would all of those in support be responding if these were horses rather than sheep? This is not the first time for this producer to find himself in these circumstances. The homeowners should have taken responsibility and had the sheep moved months ago. The livestock owner should have made sure the animals had nutrition. Period. Then yours is an opinion I would listen to. Citiots have no understanding of ranching or farming. Freshly sheared lambs always look emancipated. Its all about the money. PETA wackos are conning the public for donations. PETA’HSUS don’t care about animals PETA/HSUS are false-flag swindles. Did you look at the videos? Even the Cal Poly sheep expert said these sheep were starving. It is interesting that JB blames an ignorant public for the outcry rather than the horrific plight of the livestock. I am sure that the people who reported this situation are not unfamiliar with seeing grazing sheep, even those that are recently sheared. The pictures and video speak volumes about JB and his lack of compassion, oversight and ability to be a responsible rancher. These are very few sheep. If the whole herd looked like this, then you might have a point. However, in my understanding (granted, that is limited), there are always “losses” in any large herd. Video and photos often only provide a very narrow “snapshot” of what is going on, lacking context and substance… however, it is great for a quick emotional response. Let this thing run it’s course and see what happens before jumping to conclusions. Precisely the point. I have had older ewes that were very well cared for in a “boutique” environment that looked like that towards the end of the lives. Trot your grandmother out there in a bathing suit. She is not going to look like a 20 year old. Maltreatment is NOT the only reason for sheep to look like this or for death. People tend to forget what Mother Nature is like and how it has been for millions of years. Sheep don’t die in warm coastal southern California rainstorms. This is not comparable to livestock blizzard losses and the sheep expert from Cal Poly has already said so. Nature is only a legitimate cause when sheep are living naturally and at a low density. You farm ’em, your responsible for them. At which point you cannot care for them you sell off your stock, even if they’re just destined to become gourmet cat food. Letting them starve to death in this manner says a lot about the torturer, unfortunately from the Sheriff’s spokesman’s comment it might be saying a lot about how are Sheriff’s department views animal cruelty. Is there any group making any effort to get hay out to them right now? Hay is very expensive but I think a lot of people, myself included, would be glad to pony up in the short term. Knowing a thing or two about livestock I will say the rancher is correct; nature played a cruel hand to those sheep, however,if they had not been sheared so early in the season they might have toughed out the storm. Their thin appearance is due to a lack of adequate forage, but sheep, especially Rambouillets can survive in an arid climate with very low forage. They only look like hell when you shear them, which again begs the question, “why so early in the season?” Sheep stress easily and once stressed they die like flies, especially when a big storm hits like it did this last week. I suspect the Sheriff’s deputies will inspect the other 5000 head to see what condition they are in. If they appear healthy then nothing will happen; out of 5000 a loss of 25 is business, even if the rancher could have mitigated the problem, but if the other sheep look like the ones in the video then the rancher may have some trouble ahead. As far as the Sheriff’s Department attitude towards animal cruelty I didn’t take away that they condone cruelty; It seemed to me they are going to collect all of the facts instead of rushing to judgement. I would hope we would want them to do that if any of us were the focus of an investigation. Exactly!!! Get the facts first people before we form the lynch mob. If guilty then throw the book at him. Well written comment. What exactly are the deputies doing now? What is being done about the animals that remain on this property? I live in Grover Beach where a renter poisoned two dogs which one mine.I have an HOA called ” Five Season’s” who hired this renter, not telling any homeowners. This board took it upon themselves to let this man do jobs for them .They knew nothing about his past.Jeremy Bond HOA member” handed him keys to a shed.I as a homeowner I could not even get a key to this shed afterward. I photographed Jeromy handing renter key and photographed him working on tennis courts. I repeatably told this HOA to not mix kids and tennis courts together.There is an empty lot next to tennis courts that could have been used for dogs.They would not listen. This man killed two dogs back to back. Long suffering deaths..
Grover beach police were called by me. They came over but did not take report on dog killer. He confessed to others and police in Grover beach did nothing. Please, forgive me as this just made me have to write about what happened to my dog 9 months ago.. How can people be so cruel.How can this county not do anything. In Carmel they put a man away for a year ,after they discovered he killed a dog. This nearly killed me .I have been so sick with grief. I cannot read in-between the lines as this was also done on purpose..This screams investigate, as to have anyone loose “who has it in them to murder any innocent creatures must answer to someone? who? if the police do nothing. This is not going to bring my dog back. However there is a man free due to Police deciding to do Zero.I have zero tolerance on this..